Top 5 Firearms You Need To Get Your Hands On NOW! To the patriot who is either interested in Prepping or already knee deep into preparing for any number of potential emergencies or disasters, security has to be one of your primary concerns. This is not any truer if you have a family than if you are all alone. The simple fact of life is that when people are scared, hurting or in some other way seriously under duress, the niceness of society disappears quickly. Someone who used to be your best friend will kill you if you are standing between food and their baby is starving. It should be clear from any number of recent disasters where looting happened within days that you and your family need to plan for security wherever you are. Firearms are most commonly (and for good reason) associated with security. Are there other options? Sure, but I would rather have my trusty shotgun as opposed to a baseball bat and harsh language if there were a bunch of people trying to knock down my door any day. So, with that in mind, below are my list of the top 5 firearms you need to get your hands on now. This of course assumes you don’t have any firearms for personal protection and you aren’t philosophically opposed to defending your family’s life with deadly force if it comes to that. Shotguns are everywhere and they are relatively inexpensive to purchase. Where is the best place to purchase a shotgun? You can walk into just about any Wal-Mart and pick up a reasonably priced shotgun without too many people even blinking. Shotguns are pretty simple to use, hold on average 5-6 shots and come with a variety of ammunition options. For home defense or close quarters, a shotgun is very forgiving with respect to nervous aiming. By that I mean you don’t have to be very accurate with a shotgun to do some damage. Even the sound of racking the slide up and down can be an effective deterrent. The two most common calibers are .12 and .20 gauge. The .20 gauge is usually recommended for women and smaller kids because the recoil is less. In addition to home defense, a shotgun is perfectly suited for hunting both small game and larger animals with the right type of ammunition. Another plus is that shotguns are plentiful and the ammunition isn’t 4 times as high now with the recent talk of gun confiscation by the federal government. You can still pick up plenty of ammo and a nice new shotgun fairly easily. For the tactical minded prepper, you can even augment your shotgun with lots of accessories similar to your pistol or AR-15. Speaking of AR-15’s… This would be my second choice if you have a shotgun already. There are several reasons for making an AR-15 next on your purchase list. The first is that this is the weapon you want to use in a variety of other solutions and its strengths lie outside of the shotgun’s sweet spot. The AR-15 chambered in .223 gives you a highly flexible weapon platform. The AR-15 holds a higher capacity of ammunition so you will need to reload less often. When would you possibly need 30 rounds of ammunition? What if your home was being overrun by 50 people who had wandered off the highway from the town 20 miles away and they were deadly intent on taking your home and your possessions away from you? Or on the other end of the spectrum, what if a whole bus load of zombies was walking across the parking lot towards you. Wouldn’t you rather be able to take out 30 of the closest ones before you had to reload? The AR-15, unlike a shotgun is a medium distance hero. Where the shotgun is good for close quarters, you wouldn’t expect to hit anything with any real power above 30-40 yards. The AR-15, in a competent shooter’s hand is excellent up to 300 meters on any day. I would rather take care of the bad guys when they are very far away from me and my family. On top of its usefulness at taking out bad guys, it uses the same ammunition that your local police department, National Guard, military and now Homeland security use and are buying more of every day. The chance that you will be able to acquire some ammunition that is compatible with your AR-15 is very high in certain conditions. Now, the rub is that because of the recent antics by some in our Congress, AR-15’s and the ammunition that go in them is harder to come by. It isn’t impossible though and you can still get an AR-15 for your very own personal use in most locations if you are willing to look around and wait a while. Where can you purchase an AR-15? You can still find quite a few at gun shows everywhere and even at places like Gander Mountain and Cabella’s. Dicks Sporting goods is not stocking them anymore I believe. Pawn shops and gun stores also have them in stock, but you will be paying a premium now unfortunately. I don’t believe this will change any time soon. If you are waiting for the price to go back to what it was last summer I think you will be out of luck. There are also places online you can purchase them and have them shipped to your local FFL dealer. The dealer will usually charge you a small fee ($25 is normal) for the transaction and long wait times are still going to be a factor. Ammunition is tougher to get and more expensive but it is still out there. Shop around online and go to your gun shows. My research shows that the prices are just about the same, once you add in shipping. Know what the price of 500 and 1000 rounds are before you go to the gun show so you can be a savvy shopper. Pistols are usually the first firearm people choose for a few reasons. They are easier to handle, easier to hide and less wieldy in general. They are the weapon most of the good guys use in the movies so the natural inclination is to get a pistol and you will be all set like Bruce Willis in Die Hard. Pistols definitely have their place, but they would come after an AR-15 and a shotgun in my opinion. Why is that? A wise man once said that “a pistol is what you use to get back to your rifle”. Pistols are for close quarters and you want that to be a last resort. You don’t want to be that close to any bad guys. However, it happens and pistols are an important aspect of your survival battery of arms. Run out of ammunition in your shotgun or AR-15 and then you grab the pistol. Bad guy kicks in the door while you are asleep then you reach for the pistol close to the bed. Why am I recommending .45 or .40 and not a .9mm? It comes down to stopping power really and I know I may get some blow-back on this topic. I have all three calibers, but if I could only buy one and I was buying this for home defense it would be a .40 caliber. Why not a .45? Well, for the simple fact that you can hold more rounds in the magazine of most .40 calibers because the rounds are a little smaller. That is also why I recommend a full-size and not a sub-compact if you only have one. My 1911 .45 holds 8 rounds and my .40 holds 14. It’s just that I like options and having a few more rounds gives you more options. What about the .9mm you ask? It can hold up to 17 rounds. Yes, and like I said, I have .9mm also, but if you put a big freaked out psychopath in front of me with a machete and told me to pick one gun to use to take him down I would pick up the .45 or .40 before the .9mm. 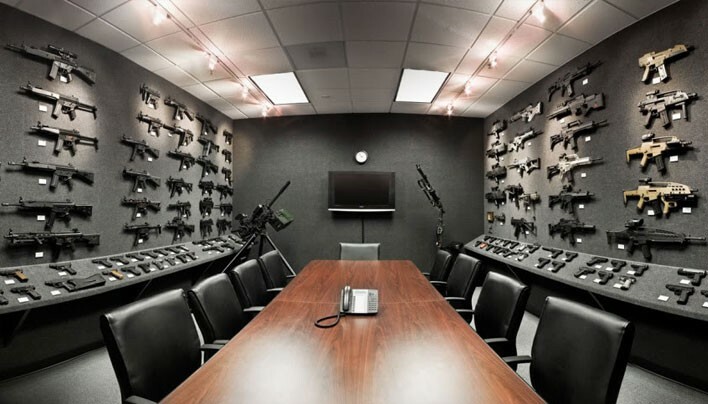 Where is the best place to purchase a pistol for home defense? Pistols are not as in demand as AR-15’s yet. I was just at Gander Mountain last week and they still had full cases of pistols in all calibers and models. The prices still looked consistent with what I would expect at that store and the only shortage I saw was of Glock. They only had one G27 on display. I personally like purchasing handguns from a gun show but you have to know what you are looking for and the price range you are willing to pay. At a gun show you have a lot more people competing for your business. I recommend finding the gun you are after at every booth, talking to the seller and getting a price. I found $200 worth of difference the last time I went for the same make and caliber of handgun so you should shop around. Ammunition for handguns is ridiculous now and it’s running about 4 times as expensive as what it used to last year this time. My advice is to get two 50 rounds boxes of hollow-points at a minimum and put those away. After that, go to places like ammunition.com and order in bulk to build up your supply. Make sure you have 4 magazines for each gun also. When it comes to a long-range rifle, I am talking about between 300 and 600 yards now and this is primarily for hunting. They can also be used to take over where your AR-15 begins to fall short. If you start going too far past 300 yards, your AR-15 will need a little help. Can you still hit targets at that range? Sure but I would rather have a caliber that isn’t slowing down already. My personal recommendation for a long-range rifle is a .30-06. For one reason, the .30-06 is capable of taking down any big game in North America. You won’t run into an animal that can’t be hunted successfully with a .30-06. Are there other calibers that can do the job? Of course, but in addition to being a great all around hunting weapon, the .30-06 is also a common sniper caliber for police forces. Where can you purchase a good hunting rifle? They are everywhere from Wal-Mart, Dicks, Cabella’s, Gander Mountain and the local neighborhood pawn shop. You don’t generally need a license to purchase a long rifle and they have lots of use. The ammunition is going to be more expensive, but if you are hunting with this rifle, you will need less; unless you are a horrible shot. The .22 is great for two things in my mind. In a rifle, the .22 is perfect for small game or varmints. A pistol is great for practice or for use by smaller children. A .22 is a great addition because you can use this to practice your accuracy and not spend a fortune on ammunition. While it is still way more expensive than it used to be you can buy hundreds of .22 ammunition for a fraction of the more common calibers. Additionally, if they ever do try to take away guns, they might leave you with a .22 and something is better than nothing. Honorable Mentions – Also known as if you have money left over… try these on for size. The Mosin is a Russian rifle used primarily during WWII and routinely runs around $100 each. For the life of me, I could never find too many of them but if you have no other option, a Mosin is a great rifle to have and could pull dual duty as a hunting rifle or a backup battle rifle. Of course, there are many limitations with the latter approach. Previous PostCan you sustain yourself by hunting alone? Next PostIs your Bug Out Bag Going to Get You Killed?